Paul Schaffran can be found at least two times a week playing 18 holes at Cripple Creek Golf and Country Club in Dagsboro where he lives. At 67, Paul is a picture of health, looks healthy, still consults part time out of his home, and enjoys being with his wife Rita Schaffran, his family and his friends. It is hard to imagine that just seven months ago, Paul collapsed in his home from a serious heart attack and lay unconscious and barely breathing on the kitchen floor. His wife Rita still vividly recalls the terrifying moments that occurred on the morning of December 12, 2015. Paul awakened at 4:45 a.m. with some pain in his chest. Since he considered himself healthy and had never exhibited any risks for heart disease, he didn’t expect a heart attack. As a matter of fact, he had always had a good bill of health at his annual physicals. That morning he told Rita that he didn’t feel well and they both got up and got dressed. Paul, feeling his symptoms worsening, asked Rita to take him to a walk-in care facility. Instead, she called 911. While the 911 operator was still on the telephone, Paul collapsed onto the floor, unconscious. The 911 operator could hear what was going on and told Rita to begin cardiopulmonary resuscitation (CPR) immediately. “I had learned CPR years ago when my daughter was in Girl Scouts,” recalls Rita, who still can’t believe how calm she was as she tried to revive her husband. She quickly started the rhythmic, forceful pumping of CPR on Paul’s chest, and continued without stopping for 15 minutes. A paramedic with Sussex County Emergency Medical Services, an ambulance with the Millville Volunteer Fire Company and the state police came to her rescue and Paul was rushed to Beebe Healthcare’s emergency department in Lewes. Paul’s condition was grim. He was taken to the Cardiac Cath Lab where an angiogram showed blockages in multiple vessels. Interventional cardiologist Ehtasham Qureshi, MD, performed a balloon angioplasty and inserted a special device called an intra-aortic balloon pump that helped rest his heart. Beebe’s multidisciplinary team that also included emergency personnel, pulmonologist Ercilia Arias, MD, and critical care professionals in the Intensive Care Unit worked to stabilize him until he could have heart surgery on December 21. Paul was able to go home three days after surgery. “His wife saved his life with CPR,” Beebe cardiac surgeon M.L. Ray Kuretu said after he operated on Paul to repair his damaged heart. 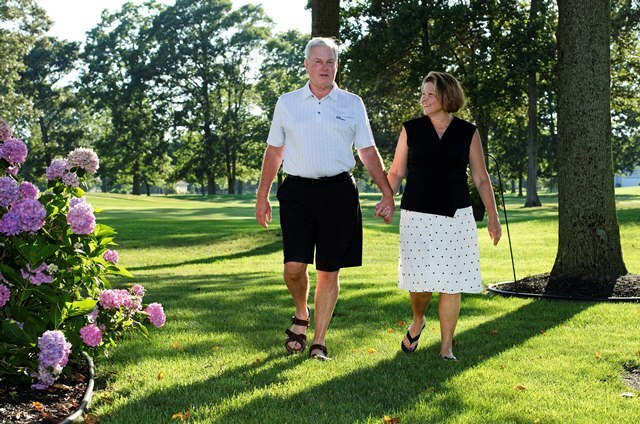 He performed a coronary artery bypass graft procedure, creating two new coronary arteries for Paul’s heart. Looking back, Paul says he knows that his wife saved his life as she performed CPR, and he also knows that the care at Beebe also saved his life. “I am thankful I am still here,” he says. Following the surgery and under the watch of his cardiologist Rajinder Prasad, MD, Paul recuperated and participated in the Cardiac Rehabilitation program at Beebe. “It’s gets you going,” he said of the Rehabilitation program. After the word of Paul’s experience spread around Cripple Creek Golf and Country Club, many residents wanted to learn CPR. The Millville Volunteer Fire Company came to the development three different times to gives classes. Statistically, more heart attacks occur in people over the age of 65. Beebe Healthcare is one of the organizations that offers free CPR classes for consumers. For more information, call (302) 645-3248.